Dean Fiore has taken out the Barbagallo round of the Dunlop Super2 Series with a maiden race victory in the third and final heat of the weekend. The Matt White Motorsport driver battled his way from fifth to first throughout a 19-lap race that was shortened from its original 28 due to time constraints. Officials elected to delay the start due to a shower on the warm-up lap, allowing teams the opportunity to change to wets. But, with the rain only brief, the field remained on slicks for what was eventually a Safety Car start. When racing proper did get underway, pole-sitter Alex Rullo led Thomas Randle, before the former ran wide at Turn 7 on lap two and dropped to seventh. Rullo dropped a further two places during the race, ultimately finishing ninth, having started from pole position. Randle led the next six laps, until Fiore edged by Paul Dumbrell and then snuck past Randle into Turn 7 on lap eight. The Tickford driver held off Dumbrell for the remainder of the race, before dropping four places in the last four laps, finishing sixth. Eggleston Motorsport's Dumbrell got through on Randle heading into lap 16 and maintained a comfortable gap to finish second in the race and for the round. Kurt Kostecki started outside the top 10 and flew threw the order, battling Randle, Macauley Jones and Garry Jacobson in the dying moments, besting his opposition and taking third. Jacobson and Jones occupied the next two places, that pair having started eighth and 10th on the grid before moving up the order. Chris Pither who started third on the grid speared off track at the same time as Rullo, dropping to 11th and ultimately finishing seventh. 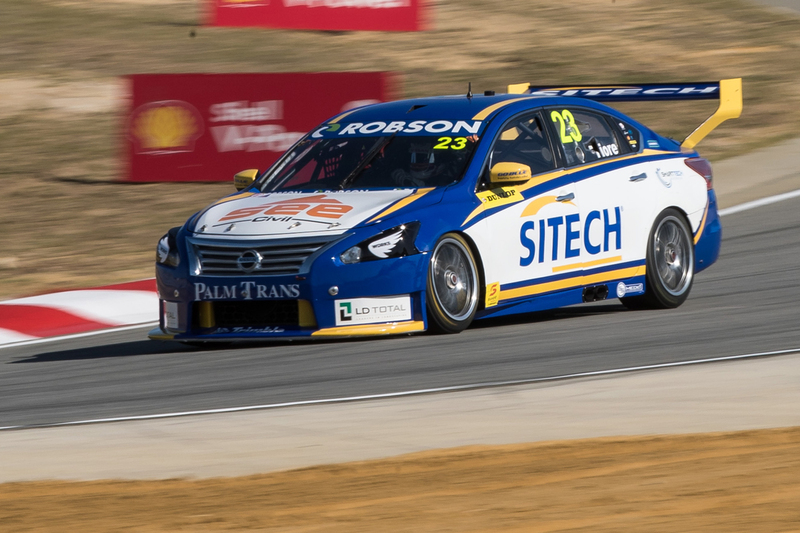 Jake Kostecki took eighth, while Mason Barbera finished behind Rullo, rounding out the top 10 in the second Garry Rogers Motorsport VF Commodore. Brodie Kostecki was scheduled to start the race ninth on the grid, but was left stranded due to mechanical trouble, unable to compete. Dumbrell extends his championship lead to 118 points ahead of Pither, with Round 4 to take place at the Watpac Townsville 400 06-08 July.